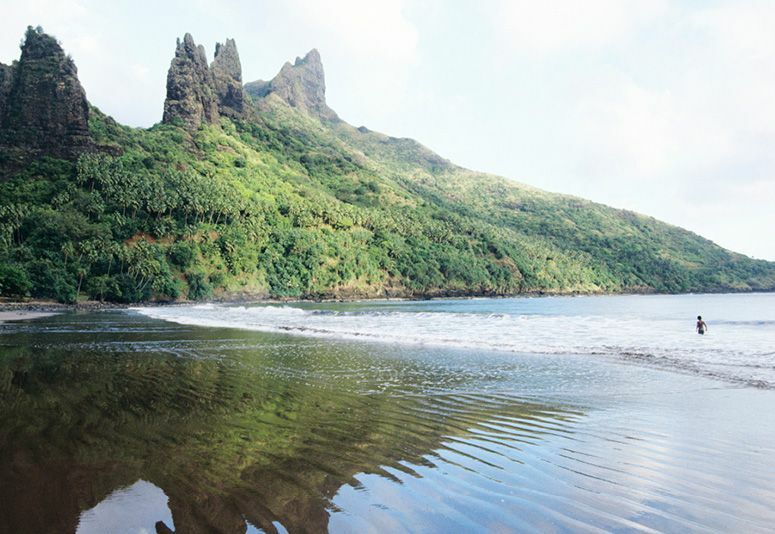 A swimmer in the Marquesas wades into the surf. That’s why I flew from Tahiti to Huahine, touching down in a lush garden of an island “bursting with jungle and giant flowers.” Because few tourists visit Huahine, the whole island has “a gentle and unassuming air,” and as I walk around, islanders hand me fresh pineapple to eat and cracked coconuts to drink. One elderly woman insists on driving me to see her favorite parts of the island, “pointing out the flowers along the way—pink and white, bushy and fragrant, growing year-round in the living earth.” On Tahaa, a round island covered with vanilla farms, “the warm ocean wind smells like ice cream.” Vanilla and jasmine aren’t the only aromas that waft on the humid breeze. There’s also the unique scent of tiare, the national flower—“a calming, sunny, lemony perfume.” Whenever I set foot on a new island, someone drapes a garland of it around my neck. At Tahiti Pearl Beach Resort (tahitipearlbeach.pf), ocean-view rooms start at $272.